PHOTO BY ALONG PHOTOGRAPHY Jackson Cavalier & The Fevertones are digging through Hell for its current project. The band is working on a trio of albums influenced by Dante's "Inferno." If Jackson Cavalier & The Fevertones were to turn it up and increase the speed, the band would just end up killing its volume and speed. You follow? It's kind of hard to explain, but ramping up the topical aspects of the band would make it lose its intensity. Fortunately this minimalist, acoustic-driven Rochester band has no intention of plugging in and peeling out. It's Cavalier's ragged tenor that leads the plunge over the band's lo-fi minimalism and earthy refrain. It's dark, but not hopeless; it's a funeral dirge without a stiff. 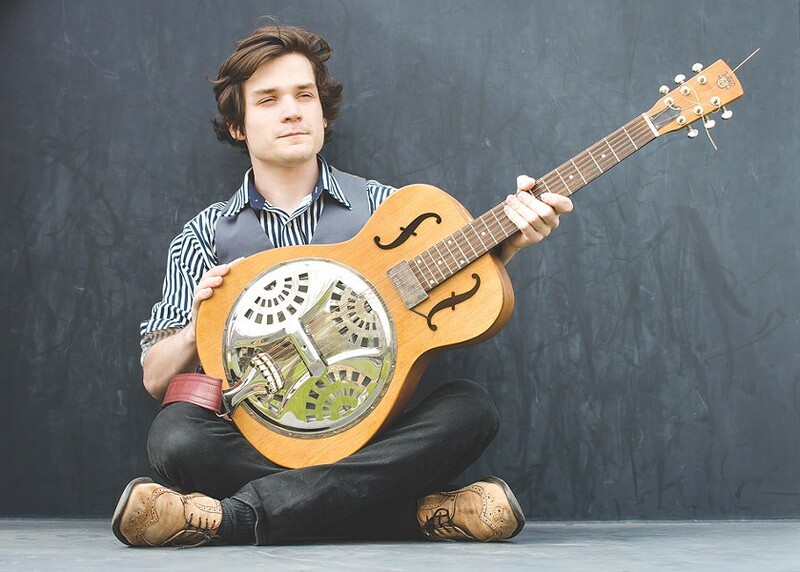 Jackson Cavalier & The Fevertones recently released "The Devil's Undertow," the second in a trilogy that finds the 22-year-old songwriter exploring Dante Alighieri's "Inferno." There's humor and irony in place to cool the flames ... or to fan them. Either way, it burns hot and cool. Cavalier sat down to discuss his sound, folk music in general, and Hell — see you there. An edited transcript of that conversation follows. City: Would the earthy intensity of your music translate electrically if you decided to go that way? Jackson Cavalier: I think I could definitely do it electrically if I wanted to. The Fevertones used to be a two-piece blues-rock group for six or seven months. Sort of like a White Stripes-type of deal. I found it hard to break into the scene with so many rock bands in it. So going unplugged was a marketing move? Almost; yeah. It came at a good time because I really liked folk music, but I never thought about pursuing it seriously. Does folk define what you do? I definitely fit into it loosely. When I go to write songs for the band, I sit down with an acoustic guitar and I keep a lot of the story telling aspects of folk involved in it. Sometimes, like recording in a studio, it can cross the line and become folk-rock, or indie rock, or alternative music. What is the most important component in folk? I definitely think it's the lyrics. I'm a big fan of Dave Van Ronk, and he said the initial meaning of folk is just songs passed on from generation to generation. But a lot of these songs have been passed down for so long that they started out as one thing and have turned into something completely different. Does recording a song arrest this progression or change? Have you experienced this phenomenon in your music? It's almost like they grow. It's still the same chords and lyrics, but the feel can change. What's weird is it just happens; they kind of take on a life of their own. What do you think attracts fans to you? Initially it was the one-man-band aesthetic, but then I just tried it with the acoustic guitar and people still liked it. Roger Kuhn aid to me, "Some of the stuff you do doesn't need drums. It carries on its own. Talk about your fascination with Dante's "Inferno." I tried reading it in high school and it was just way over my head. It's a thick read. I rediscovered it about two years ago, and was really blown away at how he brought in the mythology from his day, along with religion and politics. These are two, soon to be three, albums of really dark stuff. Why did you pursue this? It made me get a little more serious with my songwriting. Our album "Barefooted & Still Breathing," that stuff was light-hearted and fun but not as serious as I wanted it to be. There's a lot of stuff I've written in a lighter realm — nature and the laws of the natural world. But you could return to dark quickly if so inclined. It'll either be light or political and about the 2016 election.